Shepparton Shire (1879-1994), an area of 924 sq km, was east of Shepparton City and the Goulburn River in northern Victoria. The railway line was extended from Seymour to Shepparton in 1880, and further extended to Numurkah (1881) and east to Dookie (1888). The town of Shepparton was part of the shire until 1927. As the railway extensions went ahead new towns were formed in irrigated farmlands: Congupra (1877); Pine Lodge (1878); Tallygaroopna (1877). Closer settlement and soldier settlement villages were dotted along the line to Dookie: Grahamvale (1910), Orrvale (1912), Shepparton East (1912) and Lemnos (1927). At about the time of the outbreak of World War I many soft fruit orchards were producing big crops and the orderly marketing of fruit became a problem. 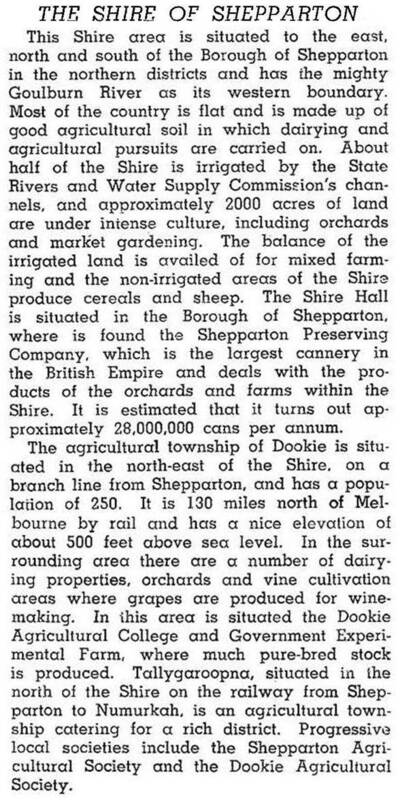 The Shepparton Irrigators Association formed a cooperative cannery, the Shepparton Preserving Company (SPC) in 1917. In 1936 a Shepparton East irrigator, John McDonald, was elected to the Victorian Parliament. He promoted the interests of growers and became Premier in 1950. He was instrumental in having the Goulburn Valley irrigation scheme enlarged by the construction of the Big Eildon dam in the early 1950s. From the 1970s urban Shepparton began to spill into Shepparton shire. Despite parts of the shire being added to the city, the shire’s population went from about 6500 to 9000 by 1990. The shire’s agricultural outputs were varied. In 1994 livestock comprised 23,000 dairy cattle, 20,000 meat cattle, 70,000 sheep, 29,000 lambs and 13,000 pigs. Orchards totalled 3355 hectares, and crops and sown pasture totalled 55,000 hectares. All farming occupied 78% of the shire’s area. On 18 November 1994 Shepparton Shire was united with Shepparton city, most of Rodney Shire and parts of Euroa, Goulburn, Tungamah, Violet Town and Waranga Shires to form Greater Shepparton City (2420 sq km).